This Canon T50 caught my wife's eye, probably because she has an AE-1. The T50 has an interesting mix of features. It was designed as an inexpensive, entry level 35mm SLR and was the first of the T series, replacing the previous A series SLRs. Because of its position as a beginners camera, automatic is the only exposure control mode. It has auto-loading and a motor advance, allowing 1.4 frames per second. All the electronics are controlled by two AA batteries. In contrast to all this automation, the focus and rewind are manual. The T50 accepts FD mount lenses, as was standard for Canon when this model was made between 1983 and 1989. This allowed an impressive array of glass options from a 7.5mm fisheye to a 600-830mm zoom. Canon introduced a new shutter with this model. All their previous SLRs had horizontal sliding cloth shutters. The T50 pioneered the vertical sliding metal shutters that are still used in their current SLRs. This allowed sync speeds higher than the 1/60th second limit imposed by the old technology. The introduction to this series has an index of all the cameras I recently acquired. Very nice series I've enjoyed reading this "Treasures from Time? series. One note about Canon shutters. There was at least one exception to the hozizonally traveling cloth shutter in Canon MF cameras -- the Canon EF from ca. 1974. 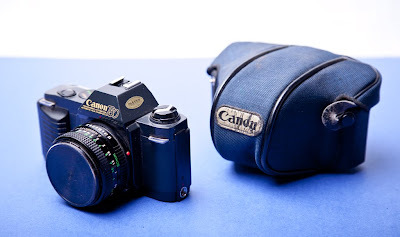 I have two copies of this cameras some times referred to as "The Black Beauty". Quoting Wikipedia "The EF used a unique shutter among Canon's 35mm SLRs: a Copal Square vertical-travel metal blade focal plane shutter". It is Similar to the Leitz/Copal shutter in my Minolta XE-7 and XD-7 from the same era.